From its origins as a modest World War II-based shooter, Call of Duty has gradually reached for the stars. Ghosts was set in the near future, while Advanced Warfare and last year's Black Ops 3 opted for a more far-reaching future setting. According to reports last month, the annualised shooter will likely be set in space this year. 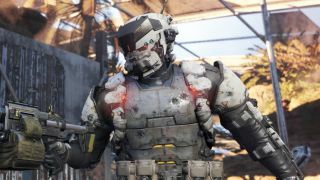 Now, according to an image posted on Reddit which depicts a prematurely posted promotion on the PS4 dashboard, the name of this year's Infinity Ward-developed instalment has been revealed. That name is Call of Duty: Infinite Warfare. It's a rumour at this stage: the listing was reportedly removed soon after appearing, and for all we know it's a mock-up – I wasn't able to recreate it on the office PS4. Still, it seems like a fairly plausible name, and if it isn't this year's new instalment, could it possibly be a remaster of Infinity Ward's Modern Warfare games? That seems less plausible. According to reports in March, this year's instalment will take place in a "full on sci-fi" setting in the "very far future". There's no lack of shooters based in those environments nowadays but, the Call of Duty series has recently made a habit of inheriting zeitgeist-y elements from other shooters (namely, Titanfall). Whatever the case we'll likely find out soon: April has traditionally been the month Activision starts talking about a new Call of Duty.